Courtesy University of Edinburgh/Maverick Photography. You've heard of Archer, one of the world's top 50 supercomputers. 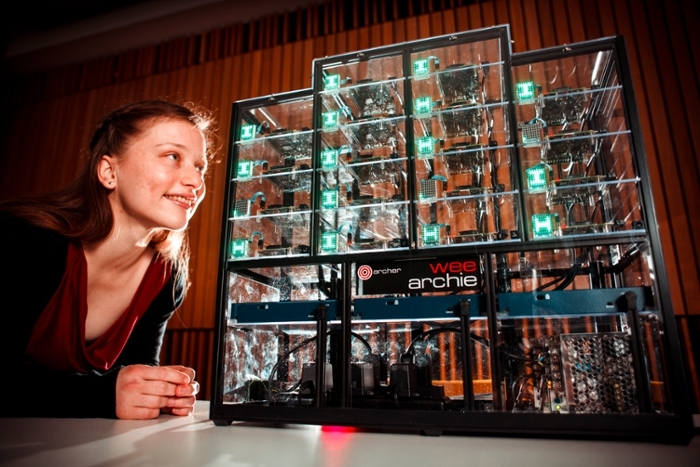 Now comes Wee ARCHIE, a tiny computer making a big mark. University of Edinburgh micro-supercomputer is a big hit. Schoolchildren get hands-on experience with parallel processing. Scaled-down components make supercomputing concepts accessible. A mini supercomputer is powering virtual dinosaur races and showing how the world’s most powerful computers work. 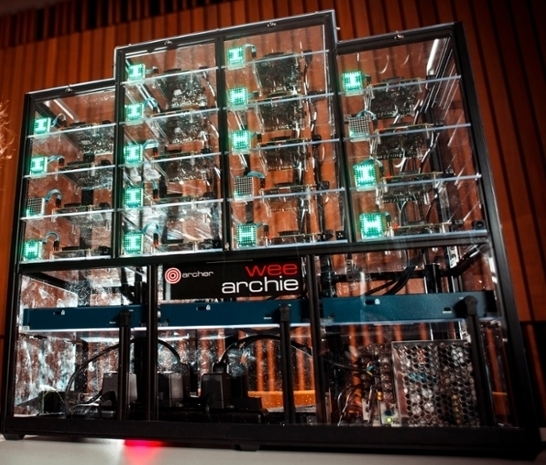 The compact machine — called Wee ARCHIE — takes its name from the £43M ($62M) ARCHER supercomputer at the University of Edinburgh's Advanced Computing Facility. ARCHER provides high performance computing support for research and industry projects in the UK. Researchers use supercomputers for tasks requiring huge amounts of processing power, such as weather forecasting and molecular modeling of biological compounds, and often occupy several thousand square feet. Wee ARCHIE, however, replicates high performance computing techniques in miniature, taking up about a suitcase worth of space. One person can transport Wee Archie in its travel case and set it up in less than five minutes. The machine simulates races between on-screen dinosaurs, letting users modify the structure of dinosaurs’ muscles and joints and alter their ability to run. Wee ARCHIE tests each of the configurations quickly, and presents the results as an on-screen race. It has already proven popular with school pupils at outreach events designed to shed light on the complexities of supercomputing. 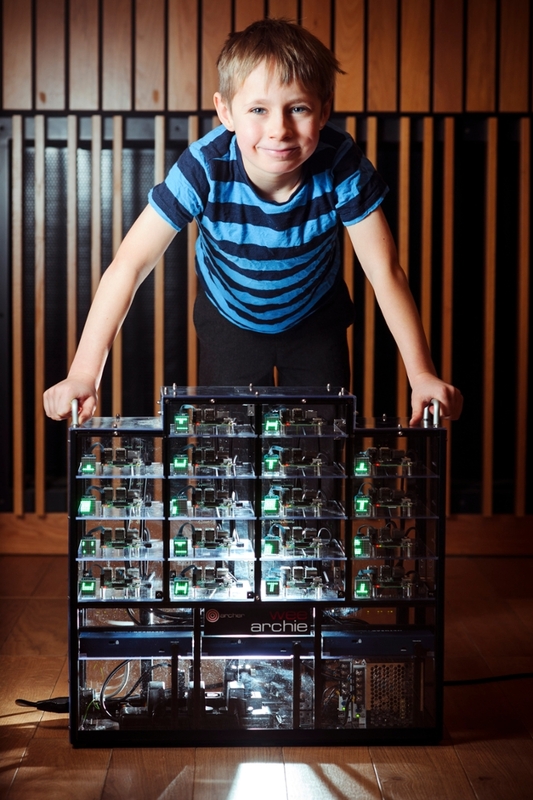 Wee ARCHIE contains 18 credit card-sized processors housed in a custom-made Perspex case. The machine has 72 cores across 18 Raspberry Pi processors with one gigabyte of RAM each. Each node has eight gigabytes of storage — which, depending on application, can be shared to give a total of 144 gigabytes. The portable system displays the types of hardware found inside the world’s fastest, most powerful supercomputers. LED displays on each of the processors light up when they are in use, showing how multiple parts of a parallel computing system work together to perform complex tasks.